Welcome to the Alfasud Giardinetta Internet page. A page by a Sud Giardinetta fan for other Giardinetta owners / enthusiasts. On the left hand side you will find buttons guiding you to the different subjects on this Internet page. Pushing any of the images in the top section will bring you back to this initial page. Topics may consist out of sub-topics. In such a case again buttons will appear which you can click to enter these sub-topics. Hopefully the usage of this site is quite self-explanatory. 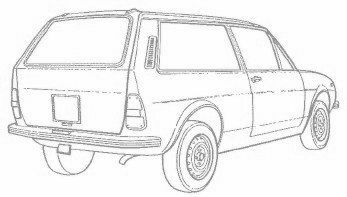 The amount of available information on the Internet regarding the Alfasud Giardinetta is rather limited. By gathering as much information as possible on this Internet page the intent is to keep the memory of this interesting vehicle alive and to keep the few surviving cars running. A vehicle register is also included. If you look at this site regularly it's probably convenient to go to the section "Updates" to see what has been added and/or modified since your last visit. Enjoy surfing this site and feel free to drop by as often as you like.